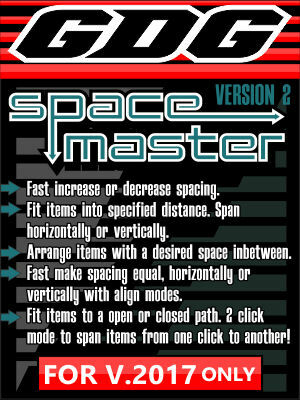 A very handy macro for CorelDraw v.2017 only, that can make easy work of item spacing distance. You can quickly arrange items either horizontally or vertically by inserting desired space in between. You can quickly increase or decrease space between selected items as well as make spacing equal with a single click. And finally you can fit items evenly with in a horizontal or vertical area. This is a great macro for optimizing and speeding up output production. New in this version 2: Fit items to path, presets, and many other great optimizations! NOTE: This version is for v.2017 only.